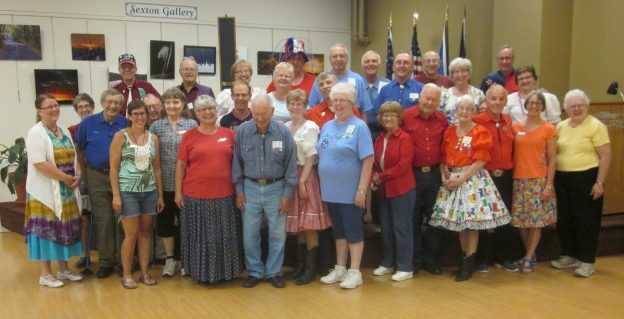 July 18, 2018 – Beaux & Belles “Red, White, and Blue“ Square Dance, St Cloud, Caller Tom Allen. Three squares with dancers (see photo above) from Spares & Pairs, Koronis Nite Owls, County Line Squares, and Beaux & Belles were present. Also present were Spares & Pairs Queen Jennifer and King Barry, County Line Squares King Doug, SDM Chair LeRoy Elfmann, and SDM Education Director Barry Downs. This entry was posted in Activities on July 21, 2018 by LeRoy.